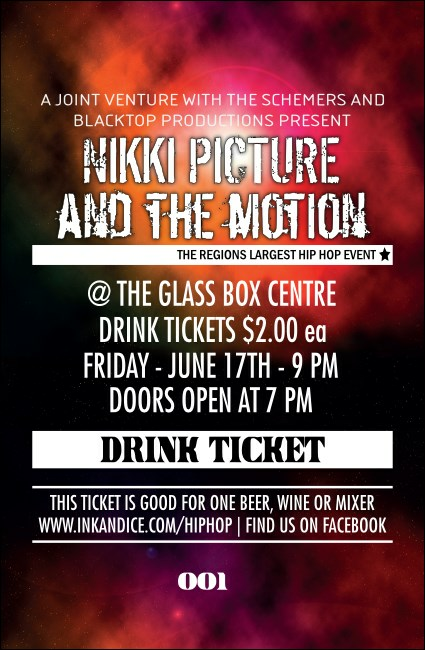 When the beat gets hot, keep your audience cool with Galaxy Hip Hop Drink Tickets. These colorful ticket templates will keep the drinks flowing while your performer is keeping the flow on stage. Featuring neon pink, orange and red gas-like colors on a black background, these Drink Tickets are off the hook. When it comes to Drink Tickets, TicketPrinting.com knows where it’s at!